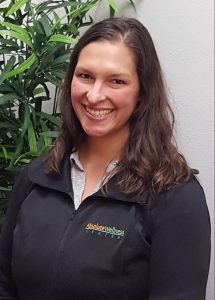 Ellie is an Oregon native with a Bachelor of Science from University of Oregon and a Master of Athletic Training degree from Texas Tech University Health Sciences Center. She is also a Certified Ergonomic Assessment Specialist and a Licensed Chiropractic Assistant. Since 2012, Ellie has gained experience working with high school athletes, college athletes, warehouse employees, office employees and patients in an outpatient Orthopedic clinic. Ellie has enjoyed working with a large variety of patients and athletics. She has treated patients ranging from middle school to retirement. Ellie has worked with sports ranging from rodeo and lacrosse to golf and swimming. Ellie specializes in sports medicine and the use of functional exercises to help her patients get back to their full lives in a safe and timely manner. Ellie strives to give her patients the tools they need to not only recover from an injury and feel healthy again, but also the strength and skills helpful to prevent re-injury. Ellie keeps her clinical skills and knowledge sharp with the latest evidence-based research in her field, and attends regular continuing education seminars and symposiums. Ellie is especially appreciated by those patients who are new to the healing process, and are learning how to strengthen their bodies and their skills. She creates a warm and comfortable healing environment, while simultaneously motivating patients to push their limits safely, helping them get through their treatment plan and overall recovery process more efficiently. In her off hours, Ellie enjoys time with her husband and two young children. She is usually working on a variety of house projects and enjoys gardening. She likes spending time at the coast and visiting her home town of Astoria. She is a fan of all Oregon Duck sports and a season ticket holder for football. Athletic trainers are sometimes confused with personal trainers. There is, however, a large difference in the education, skillset, job duties and patients of an athletic trainer and a personal trainer. The athletic training academic curriculum and clinical training follows the medical model. Athletic trainers must graduate from an accredited baccalaureate or master’s program, and 70% of ATs have a master’s degree.